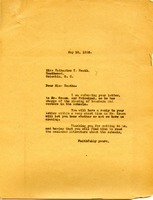 A letter to Martha Berry informing her that classes will be now be offered to work students each semester. Bethea writes about her two sons who have attended Berry, William and Johnny Bethea. William has had to leave school. He had hoped to become a doctor, but the family cannot afford more schooling for him and so he will go to work at his cousin's sign painting shop. Johnny was dismissed from school for smoking, but Mrs. Bethea hope he can go back. She asks Martha Berry to speak to both boys, as her advice will be so meaningful to them. 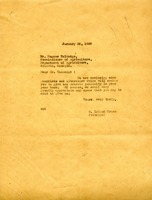 A letter to Eugene Talmadge, commissioner of Agriculture, from G. Leland Green concerning pamphlets and literature being sent to the Department of Agriculture about the Berry Schools and their agricultural work that he wished for them to put in their year book. Miss Berry writes to ask if UGA could offer the Principal of the Berry Schools, Mr. Green, an honorary degree. 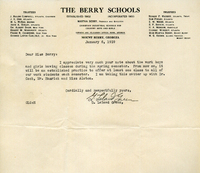 Letter from Morton to the Berry Schools principal returning an article loaned to him by Martha Berry's secretary. Letter thanks Mrs Greene for some roses and their service to the work of the Berry Schools. 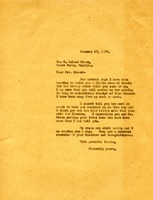 A letter to Katherine T. Heath from Martha Berry concerning her interest in a teaching job at the Berry Schools.